Due to the non availability of facility for Reports, Ease of Monitoring, the depot personnel are forced to prepare manual documents for reports in order to submit to NTC head office. The manual preparation of reports are time consuming and hence leads to long time intervals in generation of periodical reports. This slows the MIS analysis of NTC. The time spent at depots and HO for the consolidation of reports is very long, and a lot of manual effort is involved. These manual operations and lack of automatic checks result in error in reports that affect planning process, and thus the profitability of the organization. 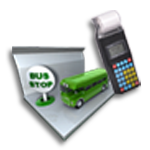 It is an integrated system for collation & consolidation of bus ticketing revenue related information from ticket issue inside the fleet right up to the generation of various financial & MIS data to the management for effective route analysis and decision making. Report generation will be allowed to the authorized personnel whose privileges are set by the administrator. This is the most potential application of Palmtec. Palmtec can be used either as a hand-held ticketing machine or as a Dash-Board-Mounted machine, to be operated by the driver. It can be charged from the automobile battery.